Tucked away in a beautiful corner of Manly near the Wharf, is Manly SEA LIFE Sanctuary. 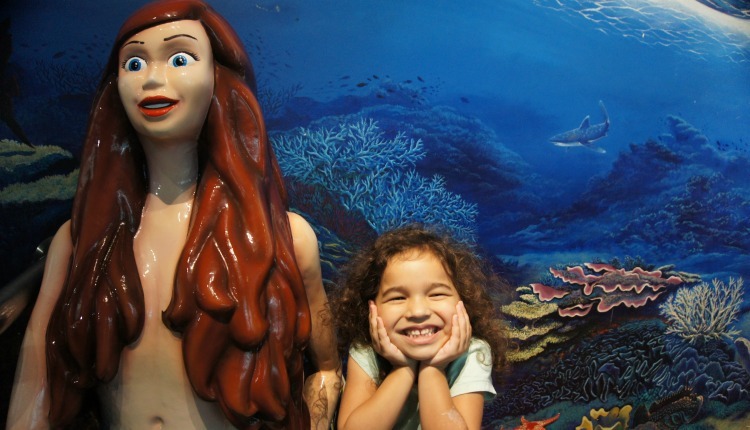 We were lucky enough to spend some time exploring the oceanarium at the start of the school holidays. I can highly recommend you add a visit to the Sanctuary to your school holiday list. 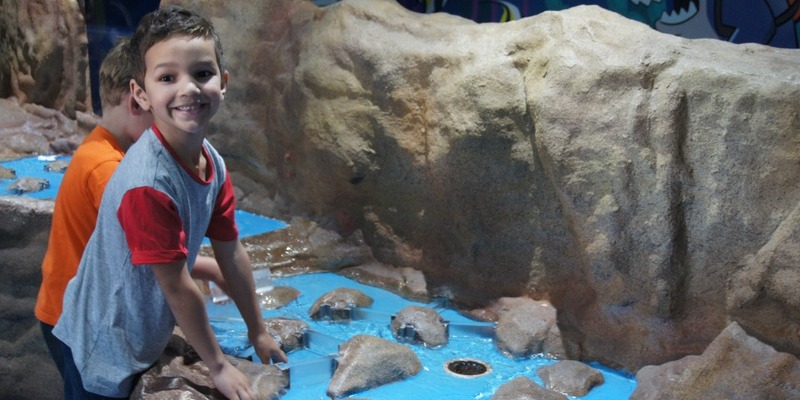 It’s much smaller than Sydney SEA LIFE Aquarium, but for us this was great – it was less crowded and much easier for the kids to get up close with the marine animals. Manly SEA LIFE Sanctuary is home to over 4,000 creatures, including Grey Nurse sharks, massive stingrays, sea turtles, baby crocodiles and adorable Little Penguins. The Sanctuary has successfully bred a variety of marine animals, and provides a safe place for injured or sick marine life to receive treatment before being released into the wild. This provides a great opportunity for kids to learn about important marine issues and how to conserve the oceans for future generations. We worked our visit around the Show and Tell times. We enjoyed some of a guided tour of the Oceanarium tunnel, and then spent time exploring the tunnel on our own. The kids loved getting up close with sharks, enormous sting rays, turtles, and fish. Our favourite talk was the Penguin feeding upstairs in Penguin Cove. The Little Penguins are quirky and noisy, and we enjoyed learning more about their habitat while watching them be fed. During the school holidays, kids can follow the Pirates Treasure Hunt. Kids can solve a number of clues by exploring the exhibits and following the treasure map (included on the Sanctuary guide given out at the front desk). This was a great way to engage our school aged child in the exhibits. He enjoyed reading the clues, and learning new facts about the marine animals. Our preschooler loved the hands-on Discovery rock pool, where she could touch a starfish, shark egg and shells. The staff were great at helping her engage with the exhibit. One of the draw cards of the pirate treasure hunt is that kids who dress up in their favourite pirate costume between 17 December and 29 January can receive FREE entry with a full-paying adult. The final stop on the Pirate treasure hunt is Shipwreck Shores, the soft play area for kids. Unfortunately the tunnel area was closed during our visit, but our kids enjoyed running around in the playground. A number of benches outside the play area are a perfect spot for parents to rest during their visit. Manly SEA LIFE Sanctuary is split over a number of levels, and does not have accessibility ramps for all levels. There is a pram parking area where prams can be left. A number of talks and shows run from 10:30am, you may want to plan your visit around the show and tell schedule. You can easily spend a couple of hours exploring. There is plenty to do and see in Manly, so a visit to the Sanctuary could be part of a day out in Manly. Manly Cove is a good area for little kids to run and splash, and is located just next to the Sanctuary. Location: West Esplanade, Manly, just 200m from Manly Wharf. Parking: There is limited street parking available, or a paid parking station just near Manly Wharf. Ticket Cost: The best prices are available online at manlysealifesanctuary.com.au. Walk up price: adult $25 and Child $17. Llynden Singh is mum to two energetic children who keep her on her toes. She has been a Sydney-sider for most of her life, and enjoys exploring the city with her family. Llynden and her husband love searching high and low for great coffee in kid-friendly spaces, trying new playgrounds to tire out the kids, and visiting museums and libraries to cultivate their family’s appreciation for culture.